Making a meat sandwich, taking the 5 train, holding out the flag, putting it in there, going up and down... I'm always in awe of people who can creatively describe the act of making love and associated sexual acts. Back in 1981, my English wasn't good enough to appreciate the full meaning of 'Pull up to the bumper': I simply thought it was about cars. Upon its original release, the single reached number 53 in the UK singles chart and number 20 in the Dutch Top 40. 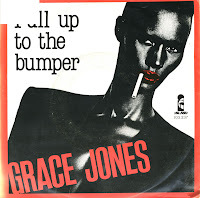 In the UK, 'Pull up to the bumper' was re-released in 1985, reaching number 12 on that occasion.